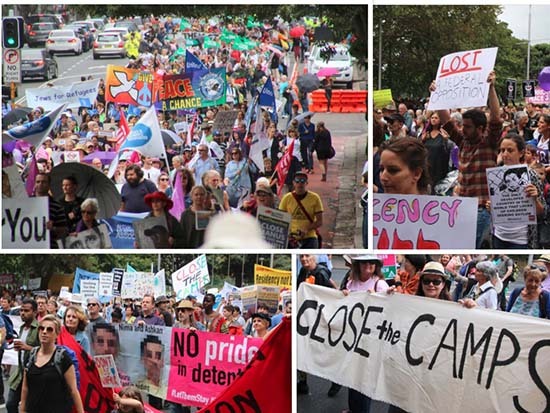 The Palm Sunday rally for refugees on 20 March was a great success with around 4000 people demonstrating in Sydney and thousands more across the country. You can see a short video reports from Sky News and SBS TV below, photos at the Facebook event here, or photos from around the country here. Photos at left of Sydney rally by Vlaudin Vega. Refugees on Nauru also staged their own protest on the day, see photos here and a video here. Thanks to all the endorsing organisations: Asylum Seekers Centre, Australian Anti-Bases Campaign Coalition, Australian Services Union NSW & ACT, Blue Mountains Refugee Support Group, Catholic Religious Australia, Carmelite JPIC, Catholic Alliance for People Seeking Asylum, ChilOut, Daughters of Our Lady of the Sacred Heart, Franciscan Friars Province of the Holy Spirit, Grandmothers against Detention of Refugee Children, Independent and Peaceful Advocacy Network (IPAN NSW), Independent Education Union NSW/ACT, Labor for Refugees NSW, Loves Makes a Way, Marrickville Peace Group, Missionaries of the Sacred Heart, MUA Sydney branch, Mums for Refugees, National Council of Churches in Australia, National Tertiary Education Union NSW, NSW Ecumenical Council, NSW Greens, NSW Teachers Federation, Pax Christi Australia, People Just Like Us, Quaker Peace and Justice NSW, Refugee Action Coalition, Refugee Council of Australia, SEARCH Foundation, Sisters of St Joseph, Socialist Alliance, Socialist Alternative, Social Justice In Early Childhood, Solidarity, Sydney Peace & Justice Coalition, Unions for Refugees, Unions NSW, Uniting Church Synod of NSW and ACT, Women’s International League for Peace and Freedom. « Nurses, teachers, doctors, academics… How can we get in the way to #LetThemStay?